Harvard citation style is not actually connected to Harvard University, and most scholars at Harvard haven’t used it since the nineteenth century. In fact, most US scholars don’t use Harvard style; it’s preferred in the United Kingdom and Australia. Harvard style does lay claim to being one of the earliest formal citation systems, taking what was formerly a jumble of ways to reference an outside source in an academic paper and turning it into an orderly system that places reference information in parentheses within the text, and then expands that information in a bibliography. For many editors today, though, this orderly system seems like a confusing jumble. We’re more familiar with the intricacies of APA, MLA, Chicago, CSE, and the like. But never fear. If you know APA, it’s really not all that hard. Harvard is just another parenthetical author-date citation style. If you can learn a few key points, you can successfully cope with Harvard referencing. The real confusion comes from the fact that Harvard style isn’t all that prescriptive; different details can vary among writers, institutions, and publications. Some prefer to put surnames in the reference list in ALL CAPS; some prefer to use normal title-style capitalization. Some prefer more spaces, some prefer fewer. There’s no one overriding manual for Harvard style, so the general rule is: ask! Always ask the professor or the department if there’s a preferred “house style” for Harvard. If you don’t know, then just apply the following general rules. In-text citations consist of the author’s surname, the year of publication, and the page number (if applicable, such as for a quote or paraphrase). Use signal phrases (e.g., “Weebly suggests that…” or “Hannarude notes…”) where it makes sense to do so. Parenthetical citations don’t need a comma between the author’s name and the year but do insert a comma before a page number, which is marked with “p.” For instance, “Proper citations must be used for all sources” (Doe 2010, p. 3). If you’re citing a work with more than one author, use an ampersand in the parenthetical citation, but do not use the serial comma with it (Huey, Dewey & Louie 1956). In the actual text of the document, write out “and”; don’t use the ampersand. If you cite a group of four authors—or a group of three or more authors more than once—you can use “et al.” after the first reference (Huey et al. 1956). If you have more than one work in the same year by the same author, denote which is which by using “a,” “b,” and so on, and include those same markers in your reference page (Smith 2001a; Smith 2001b). If you see variations on these styles using different punctuation, that’s okay! As long as it’s consistent, Harvard style doesn’t really care how you punctuate (other than that ampersand in the parenthetical citation). So if you come across a reference to (Doe, 2010: 3), that’s fine as long as later references use the same format. Harvard reference page citations are always listed alphabetically by the author’s last name and then in order by date of earliest publication to most recent. Other than that, it’s a bit flexible on what information you include and how it’s formatted. Last name, First Initial. (Year published). Title, only the first word capitalized. Edition [if applicable]. City: Publisher, Page(s). Huey, Q., Dewey, F., and Louie, D. (1956). How to quack. 4th ed. New York: Penguin. Need to cite a work that’s in another work, like a chapter or a book that has an editor? It’s similar, but the book title gets title capitalization, and the chapter title has only the first word capitalized. The edition of the edited book is always listed, even when it’s the first edition. Doe, J. (2010). How to get lost. Journal of Missing Persons, 23(2), 3–19. Citing a website? No problem! Website name (Year published). Page title. [online] Available at: URL [Accessed Day Mo. Year]. Some put article titles in single quotation marks instead of standing them on their own. Some add “vol.” and “no.” to the volume and issue numbers of a journal. This is all OK. Seriously. I know it’s hard to fathom, given how specific APA and other styles are about how to cite works, but Harvard really doesn’t care as long as you’re specific and consistent. If you give all the requisite information so that another person can find the exact source you’re talking about, each and every time, and you give the information for all your sources in a consistent fashion, you’re OK. If you want to learn more about Harvard style and read up on how one university handles it, check out this great PDF from Imperial College London. Just remember: specific, clear, consistent. 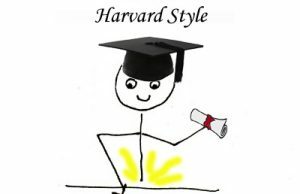 If you’ve got that, you’ve got Harvard style.